Get the feedback and insights you need to make better decisions on your applicant journeys and communication. With ConveyIQ you can seamlessly collect NPS scores, candidate feedback, and engagement numbers that are crucial to the Talent Acquisition decision makers. Collect the insights you need to start engaging your candidates with more effectiveness and clarity. Recruiting and hiring teams should have access to key insights into the candidate journey. Understanding what applicants think of their journey is critical to making improvements to attract and hire top talent. In the past, collecting such insights was laborious and time consuming, thus most teams choose to cut corners or not collect the feedback at all. Real-time access to a recruiter’s calendar. Suggest specific time slots to candidates based on your company's business rules for that interview set-up. After a candidate selects a time, Convey sends out invites to everyone and that time becomes unavailable for others to book. Real-time access to any hiring manager’s calendar. Suggest specific time slots to candidates based on your company's business rules for that interview set-up. As the organizer of the interview, you can choose to be included -- or not -- on all invites. In many hiring processes, there are a host of team members who may take turns running the same round of interviews. Imagine a team of 20 engineers, any one of which can run the 1st round interview with a new candidate. 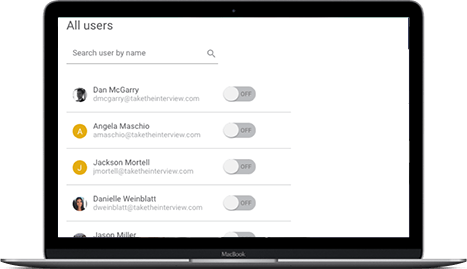 With Convey, you can choose which team members participate in interviews, set up rotations or designate mandatory interviewers for each job opening. Convey will take care of the rest, setting up the correct interviewer with your candidate. Getting multiple members of your hiring team to interview a candidate at the same time is no longer a time-consuming process. 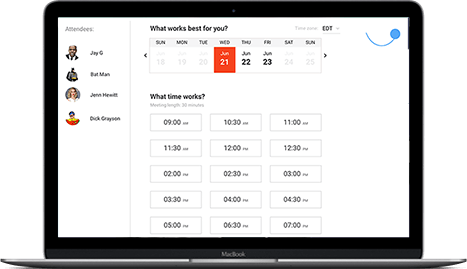 With Convey, you can create a ‘team’ and set up scheduling rules defining duration, location, online/in-person, and all other relevant interview details. 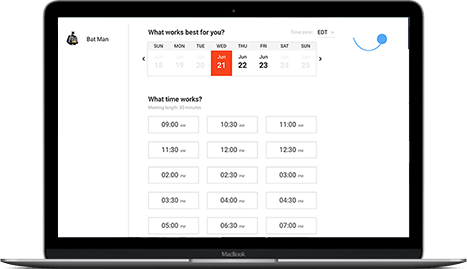 Convey will find times that work across the board, and your candidate will self-schedule themselves, choosing from times that work for your entire hiring team.